The OHS Peace Club is a student-led club that focuses on raising awareness about national and international issues challenging the ability of humans to achieve a peaceful world. Peace Club meetings are held in Room 325 on TUESDAYS during PLUS Lunch. All students are welcome to attend. For the 2013-14 school year, Peace Club raised awareness about the plight of Syrian refugees and raised money for International Rescue Committee, which provides critical services for Syrian refugees. During the 2012-13 school year, Peace Club raised money for Carolina for Kibera (CFK) which provides health services and other programs to help people living in extreme poverty in Kenya. In the 2011-12 school year, Peace Club focused its efforts on raising money and awareness to help alleviate the famine occurring in East Africa. As a result of a number of successful fundraisers, Peace Club members donated almost $2,500 to Doctors Without Borders for their efforts in East Africa. During the 2010-11 school year, students raised over $2,000 for Invisible Children and hosted a screening by the Roadies from Invisible Children at OHS. During the 2009-10 school year, the club raised and contributed money for a school in rural Tanzania to help finance construction of a well on their school campus. Without the well, students had to walk approximately 7 miles a day to obtain water. In previous years, the Peace Club raised awareness about the genocide in Darfur and the plight of child soldiers in Uganda. Oct. 1, 2012 during 1st period, Peace Club hosted Carolina for Kibera which screened their new documentary Without A Fight. They concluded with a discussion of their efforts in the Kibera slum in Kenya and a Q & A with the producer of the film. Peace Club members participated in a 10 mile walk to raise money for Doctors Without Borders' efforts to improve health services for those in need in East Africa. The walk will took place in Eno River State Park along several of the parks western trails. Peace Club hosted a presentation by the Global Poverty Project (GPP), an international non-governmental organization. Peace Club Benefit Concert to raise money for East African Famine relief was held on Monday, December 19, 2011 in the OHS Auditorium. There were several musical acts including a rap performance by NC and a rocking set by Corrupt. All proceeds were donated to Doctors Without Borders for East African famine relief. Peace Club and the OHS Band hosted this event at 7pm in the OHS Auditorium. All proceeds were donated to Invisible Children and Doctors Without Borders. We sold a variety of items hand-made in Zambia. INVISIBLE CHILDREN RETURNED TO OHS ON FRIDAY, NOVEMBER 18, 2011! OHS Peace Club welcomed back the Roadies from Invisible Children for a return visit to Orange High School. They screened their documentary called The Rescue, and introduced some new Invisible Children initiatives. The Advocates (Marilyn, Bit, and Bailey) from Invisible Children visited Orange High School on Monday, October 4th, 2010 and screened their documentary GO. OHS nearly packed the auditorium with close to 600 seats filled for the screening and Q & A session with the Advocates! Peace Club worked hard to harness the energy built up during the screening to raise awareness and money for Invisible Children's Schools for Schools program. We hope to continue our partnership with Invisible Children as we move forward. 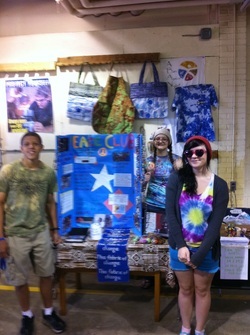 Peace Club had an extremely successful Ag Day effort on Oct. 1, 2011. Peace Clubbers sold necklaces made in Zambia, items from ABAN (check out www.ABAN.org for more info on the extremely worthwhile efforts they are making in Ghana), hand-made bracelets, "vintage" tie-dyes, and other items. The money raised at Ag Day will be donated to Doctors Without Borders to help with their efforts to address health needs of people suffering from famine in East Africa. Pictured are Michael, Terri, and Maddie at the Peace Club table.